The quality of canned chicken broth pales in comparison to what a pot of water, a used carcass, and some heat can produce. It's easy. The biggest investment is time. And nothing beats a bowl of steaming chicken soup when you're feeling run down. 1 Bring water and seasonings to a slow simmer in an 8 qt. stock pot. 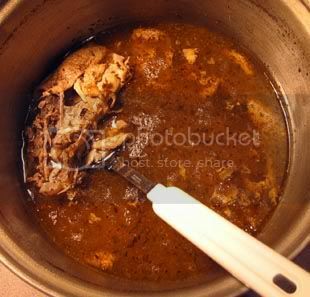 Add chicken carcass, bones, and scraps. Simmer for 3 hours, stirring periodically. Turn heat off and allow to cool for an hour before straining. Note: I used the frozen remains of a 3 lb. chicken that was roasted a week prior. After dinner on the night of roasting, I sit quietly and strip the bird of its meat. The FRE opts to leave the room during the stripping process. He's especially unsettled by the sound of the leg bone twisting in its joint. You may also add vegetables with the seasonings at the beginning. Coarsely chopped onion, celery, carrot, and garlic cloves are the typical additions. 2 Remove largest pieces with a slotted spoon. Then strain stock through a fine sieve. 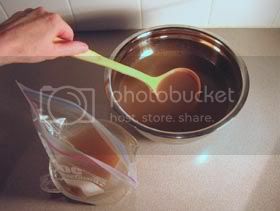 You can remove fat now with a fat separator (my choice) or pour stock into a bowl, cool to room temperature, cover, and refrigerate overnight. The fat will rise to the surface and harden. It's easily spooned off. 3 Divide stock into portions and freeze. Manang uses a muffin pan. I usually use 2-cup storage containers but I saw this method in Cook's Illustrated this month: Ladle stock into 1-qt. 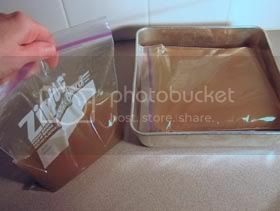 ziplock freezer bags (I propped the bag in a 2-cup measuring cup), lay bags into a baking pan, and freeze. Clearly this post is super old, so I don't know if anyone will respond, but I was wondering whether I should put a lid on the pot while simmering or not. Thanks, this recipe looks great! Hi Lena. I don't use a lid. The house gets pretty steamy. If you do use a lid, don't cover it all the way. You might want to turn down the heat a little too to keep the contents at a slow simmer, not a boil. yes, use a lid, it will use less energy to cook.